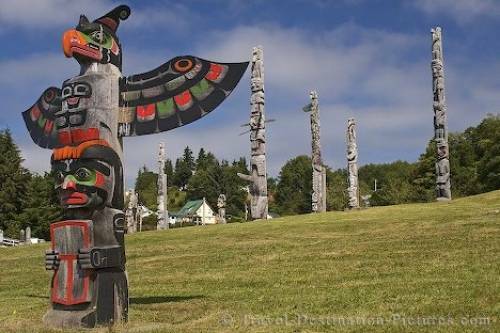 One of the most impressive collection of authentic totem poles are to be seen in the small town of Alert Bay in Johnstone Strait off Vancouver Island. These poles are guarding the graveyard of the town. Picture of Totem Poles in a park in Alert Bay on Cormorant Island in British Columbia, Canada.